We know that the New World has been a bit uneventful lately, but the eMinions have been busy fiddling with the Economy. The resources distribution that resulted from last month’s Resource Wars Event will be live on Day 3,145. As announced, along with this come some changes to the Economy Module. The most important of them is that from then on the Companies will no longer “travel” with the citizenship of the owner but will be established on firm ground. For this purpose we are introducing the Holding Companies. A Citizen can set up one or more Holding Companies in different regions, according to their needs in terms of productivity bonuses. A Holding Company can own any number of finished goods and raw Production Facilities and those will benefit from the productivity bonus of the Holding Company. Keep in mind that in order to create a Holding in a region of your choice, you must travel there first. How much does it cost to create a Holding Company? Holding Company cost = Number of Holding Companies owned * 25 Gold. As per the above formula, the first Holding Company created is free. How much can be assigned to a Holding Company? Holding Companies can hold an unlimited number of Factories. Please note that when you create a new Factory, it will not be assigned to any Holding Company, therefore it will not function. However, you can assign it afterwards for free. Can I re-assign a Factory to another Holding? 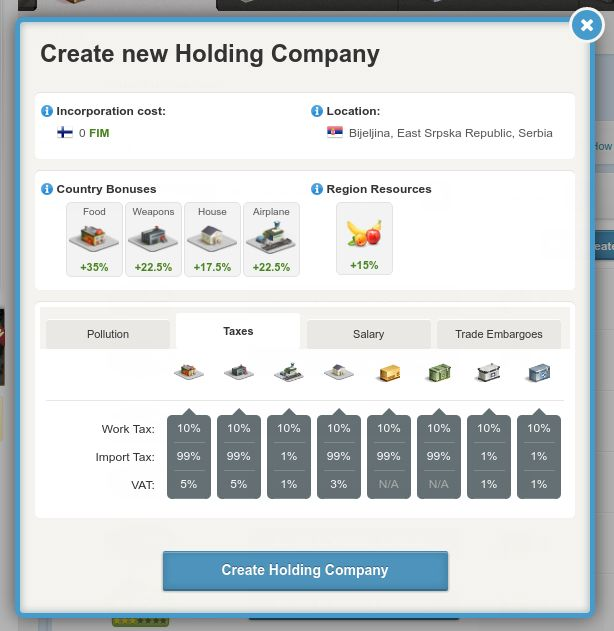 The first time you assign your Factory to a Holding Company, you will be able to do so for free. You can later relocate your Factories if you want to, but relocating them will have a certain cost depending on their type. 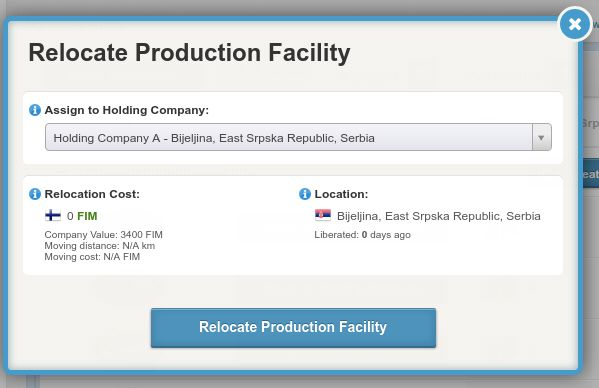 The cost for relocating a production facility is based on the value of the Company and the distance between the two Holding Companies. The relocation fee is paid in Currency and varies between 5% to 20% of the Factory face value (discounts do not apply). Let’s take for example a Q7 Weapons Factory, its face value is 1230 Gold (10 Gold creation + 1220 cost of upgrades). Using the Monetary Market exchange rate, that value will be converted to Currency (assuming an exchange rate of 400 Currency / Gold). 1230 Gold would translate into 492000 Currency, which would bring the assign costs between 24600 and 98400 Currency depending on distance. The formula for relocation is 4% company value + 1% of value for each 1000 km travelled, capped at 20% value. Please note that you cannot re-assign a Company to the same Holding and the assign costs only apply from the 2nd move onward. A Holding Company is required in order to post job offers. Once posted, an offer will be available on all the markets (countries) where the Citizen has Holdings. Current Job Market offers will remain, but will not be visible until the owner has Holdings, at which point, they will become visible in the Country that currently owns the Holding’s region. All existing Factories will initially be unassigned. An unassigned Factory cannot produce goods, they need to be assigned to a Holding first. After the creation of a Factory, it will show as unassigned and, in order to start producing in it, it needs to be assigned to an existing Holding. If the Country where the Holding is located has a trading embargo against the Country of citizenship of the owner of the Holding, the owner cannot work as manager. Selling/Buying Factories on the Market. A Factory that is assigned to a Holding Company can only be bought via another Holding Company in the same region. A Factory that was not assigned to a Holding can be bought as such by any Citizen, no matter where his Holding Companies are. In order to be able to work as manager, you will need to be located in the region where the Factories are located. When the Country of citizenship of the manager is in direct war with the Country where the Holding is located, the manager cannot work in the factories of that Holding. Paid tax: 80%(Holding Country work tax) + 20%(Citizenship work tax). As a reminder, for Work as Manager, the Income Tax is paid based on a Country’s average salary and Work Tax law. 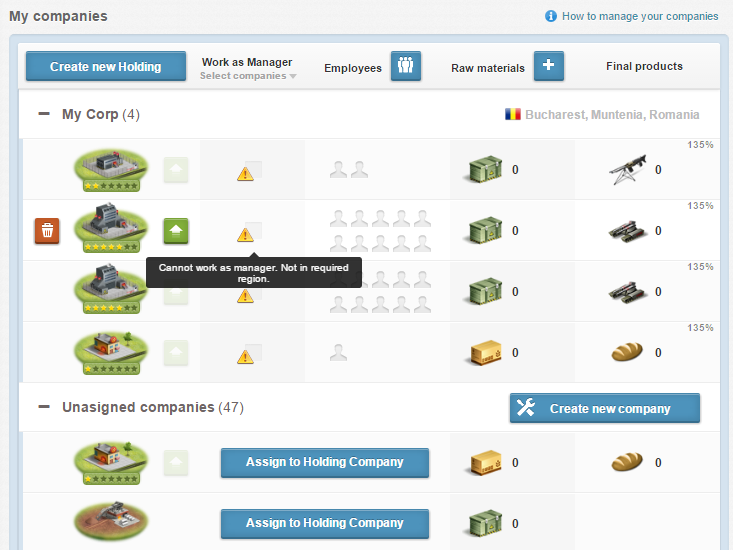 Example: Citizen works as manager in a Holding located in Country A and has citizenship in Country B. He will pay 80% of country A’s Income Tax (to Country A) and 20% of Country B’s Income Tax (to Country B ). Pollution Factor is calculated based on the number of goods of the same type that were produced in the region compared to the overall average production for that type of goods. The factor varies between 0 and 25%. The more goods are produced in the region, the higher the pollution will be. Each product type/quality pair will have its own pollution. All raw Factories will share the same pollution for their respective industry (Example: Fishery, Grain, Farm and all other Food Raw Materials will share the same Pollution Factor). The Country Productivity Bonus is the sum of distinct industry resources the Country owns. IE: if a Country holds all 5 resources for an industry and the regions are linked to the capital, the Country Productivity Bonus will be 100%. Keep in mind that if a region is not linked to the Country capital, half of its resources’ productivity bonuses will be used in the formula (ex: 25% for rare will become 12.5%). The Region Productivity is the sum of the industry specific resources available in the region divided by 5. IE: if a region holds the best 4 resources for an industry, its productivity bonus will be 18%. Q: Is there a time limit for when we can create the free Holding? A: No, the first Holding is free for everyone. Q: Can I still work as a manager if I don't create my first Holding? A: No, in order for companies to produce any goods, they must be allocated to a Holding. Q: Does the worker need to have a citizenship of the country where the Holding is? A: No, there are no citizenship restrictions. Q: Are holdings located in a region visible to anyone? A: At the moment, the holdings are NOT visible. Q: Can I use my raw materials produced in another Holding? A: Yes, the storage principle has not changed. All produced goods will be stored in your Storage as it is now. Q: Do I still need a licence in order to sell in the country I have my holding in? A: Yes, the Holding does not give you the privilege to sell in the country where it is located so a licence is still required. Q: Are there any restrictions as per where I can place my holdings? A: No, countries cannot forbid citizens from placing a Holding in their country. Q: Are the works by my employees stacked globally? A: Yes, any works can be used in any Holding. Q: Can I change the location of my Holding? Q: Will the Pollution be visible anywhere? A: Yes, it will be displayed on the page of each region. Q: Which country will get my work-tax? A: Work tax for employees will remain the same for now, and will go to the citizenship country of the employer. Finally we got some strategy again ! By the end of the month as promised. Last day in fact. Is there a time limit in which we can create the free Holding Company? "Regions will be affected by a pollution factor that is based on the number of “works” done in the Region in the previous day." And now you claim that it's separate for each industry in the region? Do you understand just how much difference that makes in optimal bonus allocation? Why is it that Romania was the only country to do it differently and now it benefits them??? Just a man, and his will to survive. When productivity bonus is not a full number, for example 12.5 as you stated, and I produce weapons (so 10 items), will I produce 12 weapons and half of a weapon that will be produced the next day or is that 0.5 weapons lost every day ? If you will not create a first free holding company you will be able to work as manager? Edited by Galaxy2100, 25 June 2016 - 12:16 PM. as they say: " An unassigned Factory cannot produce goods, they need to be assigned to a Holding first." therefor you won't be able to work in it. And another question : will the holdings located in one region be visible by the government, by everyone, by noone, by the regional government you will instore later on. I mean, will there be a way we can see who places which companies in what region ? This could help governments organise their country way better in my opinion. Does the worker need to have cs on some of the countries where you have holdings, or will it keep on being as it is now? - How to improve the economy? - Simply limiting the production and complicate the game of the ordinary user.